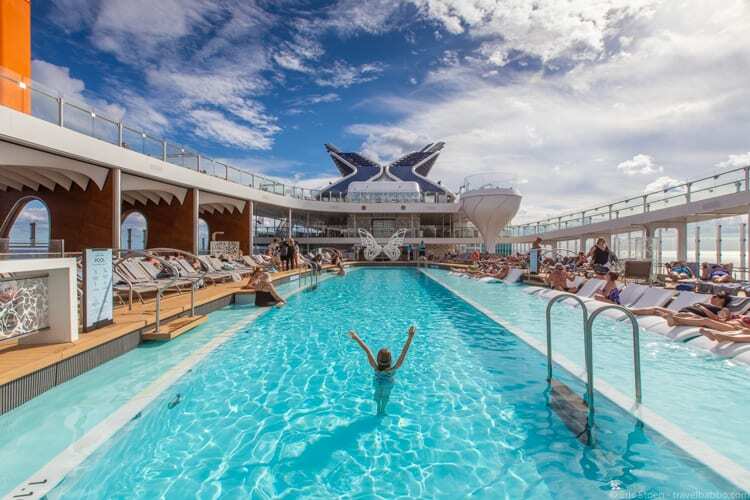 When I received an invitation for a preview sailing of the Celebrity Edge, I wasn’t initially excited. 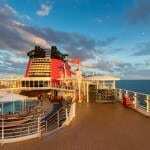 Our last cruise with kids with Disney had been decidedly mediocre and we didn’t have another cruise in our travel plans. But I was also intrigued. 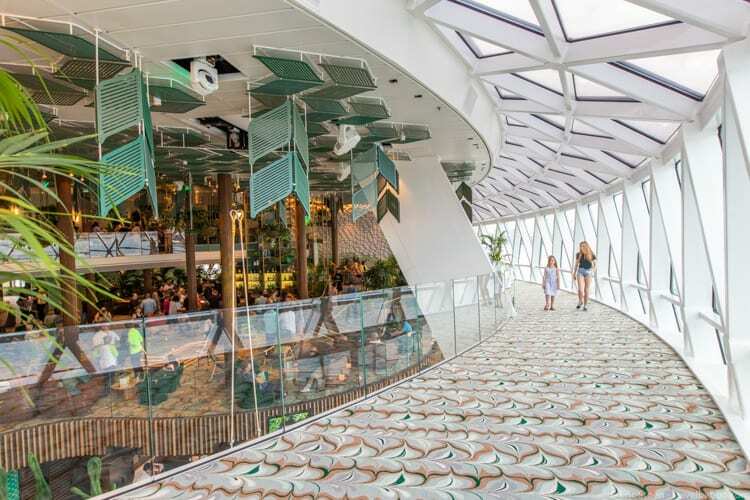 The Celebrity Edge was supposed to be the most advanced ship ever, with some really cool features like a cantilevered restaurant on the exterior of the ship. And then when I mentioned the invitation to my 8-year-old daughter, she jumped at the opportunity to miss a couple days of school and join me. I mean, how many times would she be able to say she was one of the first kids ever on a ship? So I accepted the invitation and we flew out from Santa Barbara on a Wednesday morning, connecting in Phoenix and Charlotte, and arriving into Fort Lauderdale around 8pm. The nice thing about Fort Lauderdale is that the airport, several hotels, and the cruise port are all very close together make the trip easier. Less than 15 minutes after walking off the plane we were at our hotel. Thursday morning we checked out of the hotel at 11:00 and then headed to the cruise port at noon. Check-in and embarkation were remarkably fast because we had already completed all paperwork online, including uploading photographs. Definitely do this to save time, either through the app (iTunes | Google Play) or website, in order to skip lines. A couple of facial scans and a luggage check later, we were walking onto the ship. We headed straight to our cabin. We were in stateroom 12228, near the middle of the ship on the deck right below the pool. 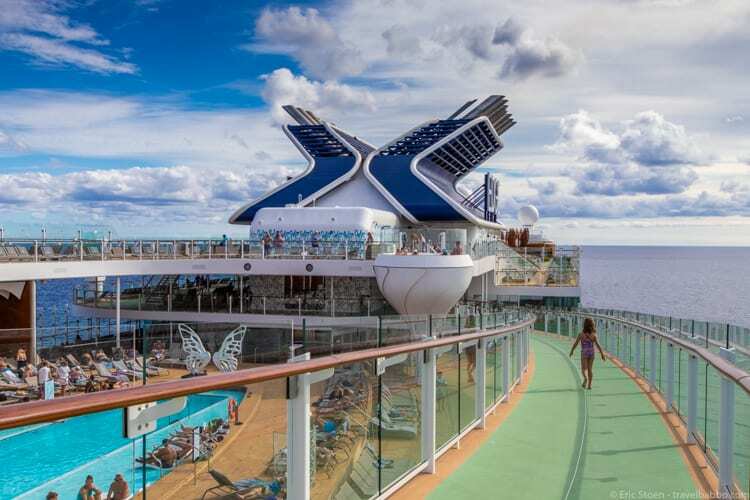 We always prefer stairs to elevators on ships, so it was a little bit of a hike to Camp at Sea (the Deck 3 kids club) and the Deck 4 restaurants, but it was extremely close to the pool, the Rooftop Garden and the Oceanview Café – the main buffet spot (and site of the all-important 24-hour coffee). 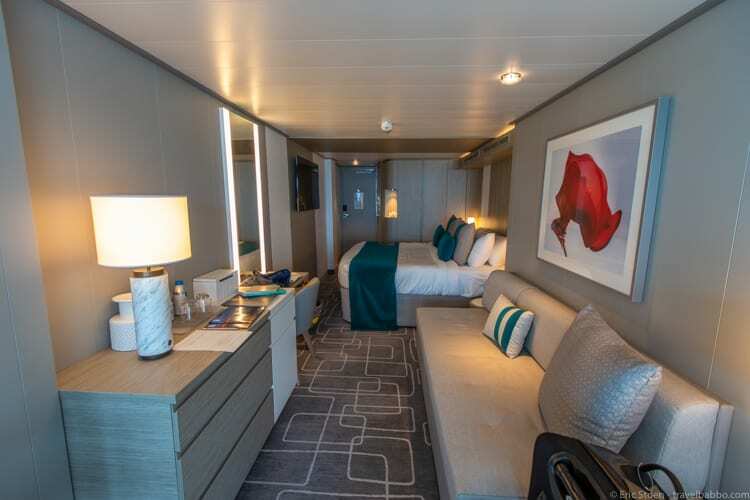 The cabin felt large compared to cabins on other cruises with kids we’ve been on. There was plenty of storage (drawers and closets), and the bathroom was large by ship standards. 12228 sleeps four. There was one king-size bed and a couch that converted to another bed. There’s a very upscale feel, including the gorgeous bathroom and shower. 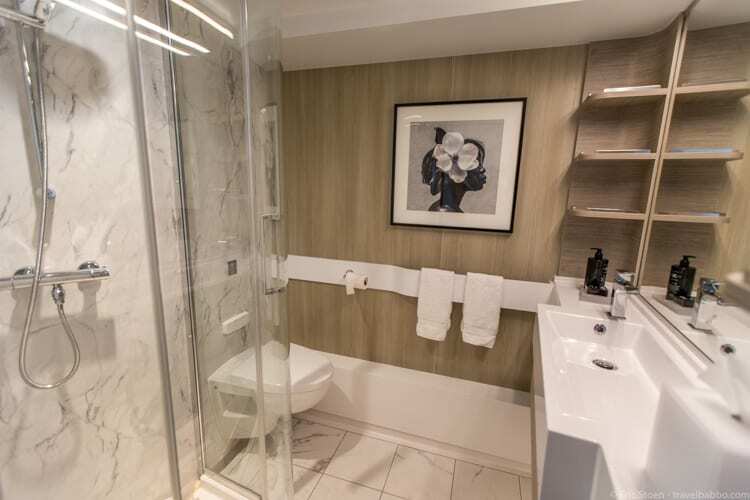 Our bathroom on the Celebrity Edge. Huge compared to other ships we’ve been on. One of the coolest elements is that there is, and isn’t, a balcony. 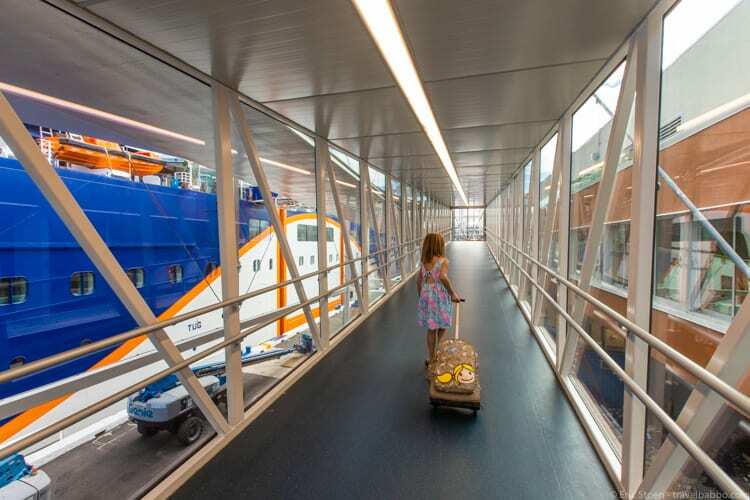 It’s basically an enclosed veranda (an “Infinite Veranda”), where you can have the interior door open and have a larger cabin, or close it off and have a separate patio. 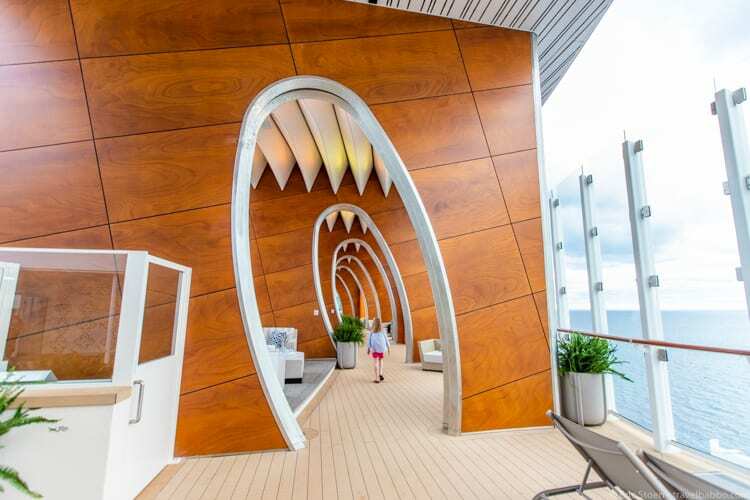 There’s a window that raises and lowers, giving you the same feel of a standard ship balcony. 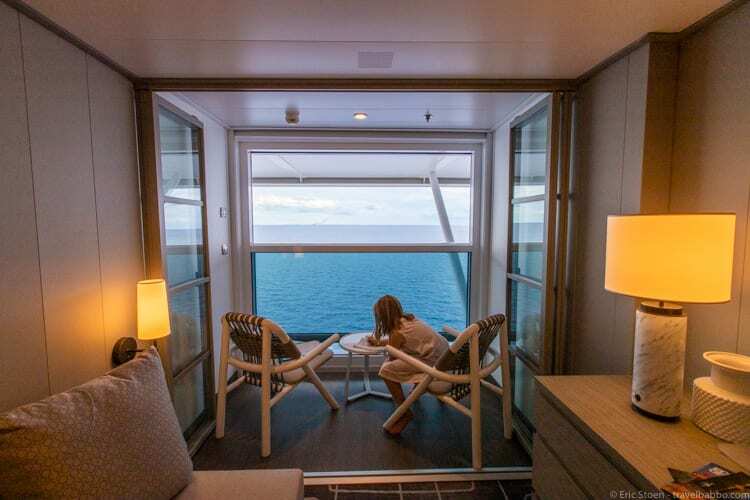 When we were in the stateroom my daughter spent half her time on the bed and half in one of the chairs on the veranda – typically doing homework. 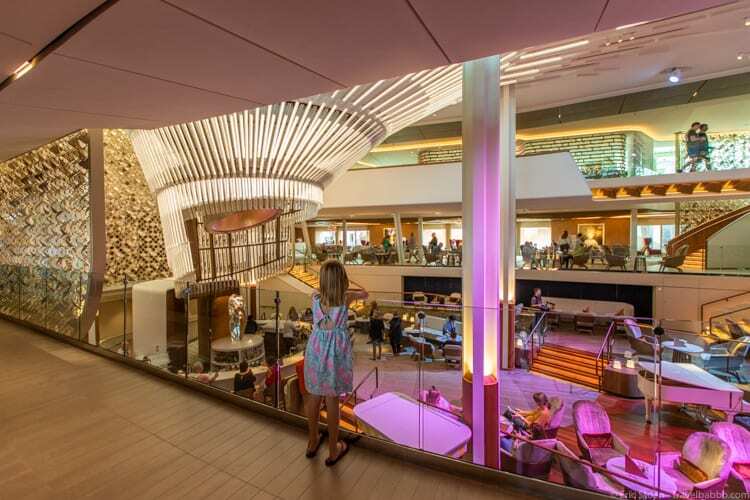 We LOVED walking around and exploring the Celebrity Edge. It is truly an incredible ship from a design perspective. 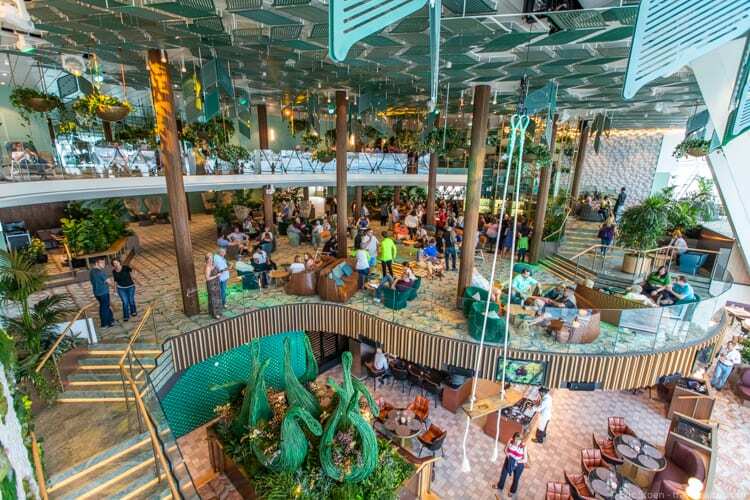 From the three-level Eden area to the pool and pool cabanas to the previously-mentioned cantilevered restaurant/lounge (the Magic Carpet), it’s spectacular. 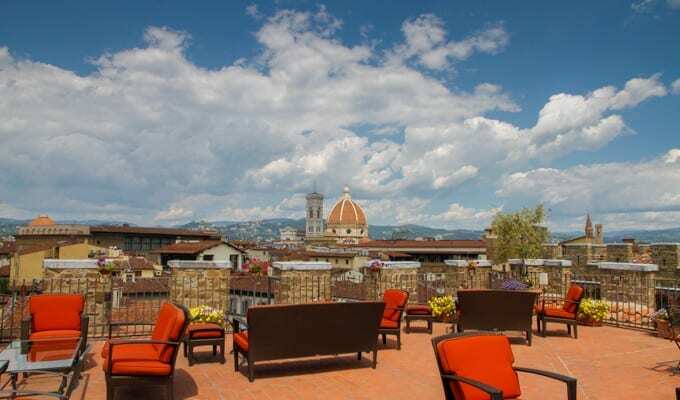 And it’s colorful (in a very classy way) and there are places to relax everywhere. Our preview cruise was unfortunately only two nights, and I have the feeling that even with all of our exploration, we missed a lot. 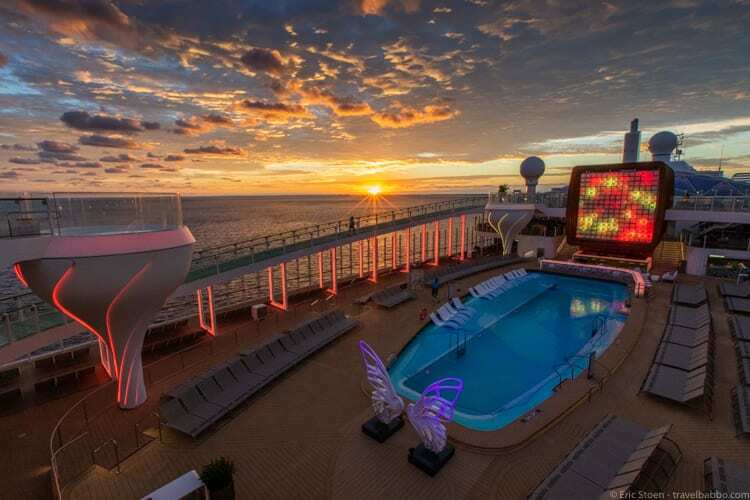 Over a 7 or 10-day cruise, I’d love constantly finding new places to relax and read. And I went up to the top deck both mornings to watch the sunrise, but both days the sun was in the same direction relative to the front of the ship. I’d love to be able to see the sunrise (and sunsets) from different spots. 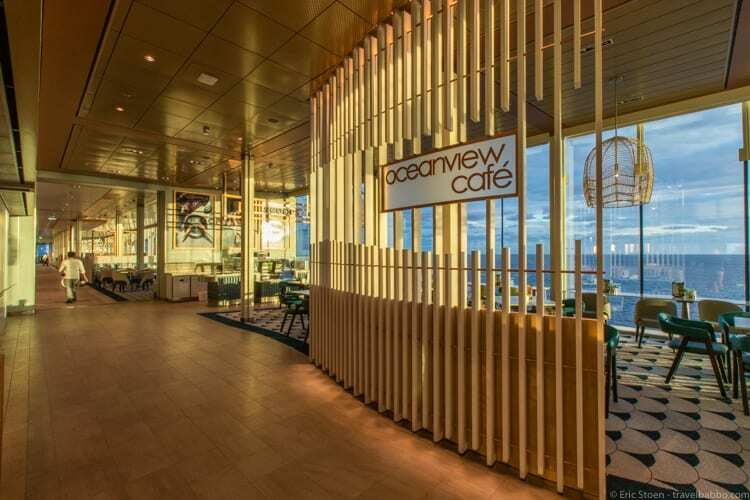 There are 29 restaurants, cafes, bars and lounges on the Celebrity Edge, from the Oceanview Café that serves all meals (in buffet style) to Luminae and Blu which are reserved for certain suites/guests, to Fine Cut Steakhouse, Le Grand Bistro / Le Petit Chef, Raw on 5, the Magic Carpet, the Rooftop Garden Grill and Eden, with dining on a reserved basis. 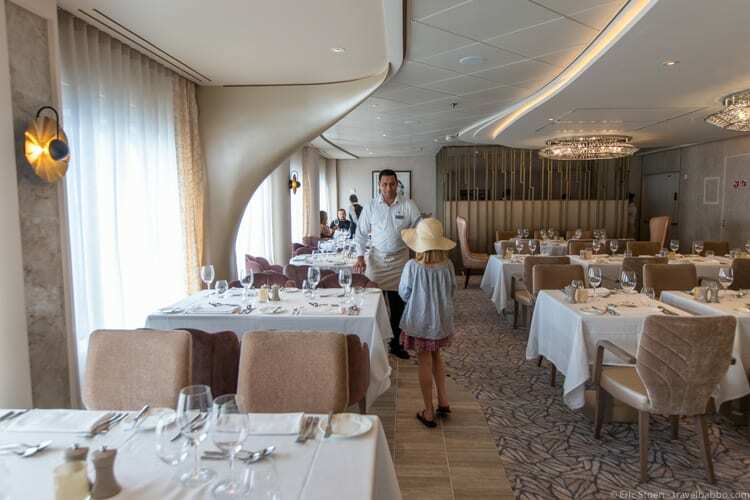 Plus there are the main four restaurants (Tuscan, Cyprus, Normandie and Cosmopolitan). 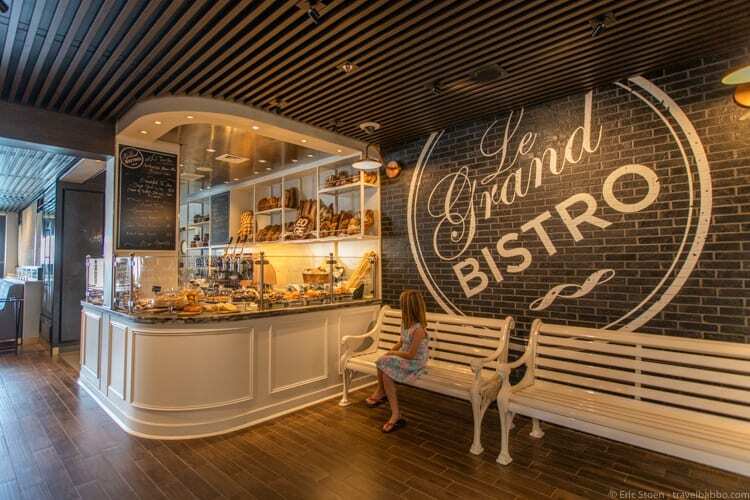 We had breakfast each day at Oceanview Café, lunch both days at Cosmopolitan, a late afternoon snack at the Mast Grill, and dinner at Le Petit Chef (the transformation of Le Grand Bistro in the evening) and at Oceanview Café the second night. 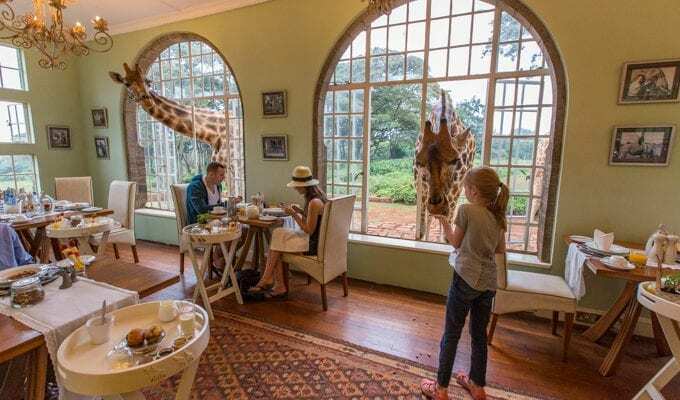 We could have been more adventurous, but when I travel with my kids they get to choose, and buffets are simply easier and more flexible than set seatings. 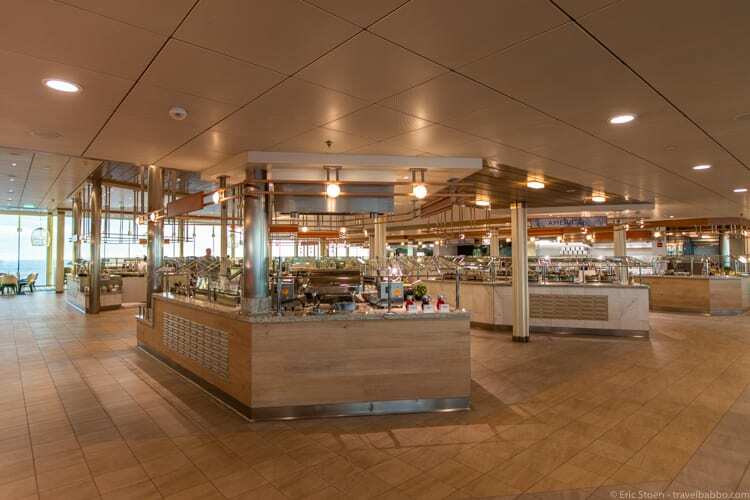 Plus the food at the buffet is legitimately good, with a lot of meat and vegetarian choices and international selections (heads up – some of the Indian dishes are spicy). And there are a ridiculous number of desserts. I mentioned Le Petit Chef. Do this. 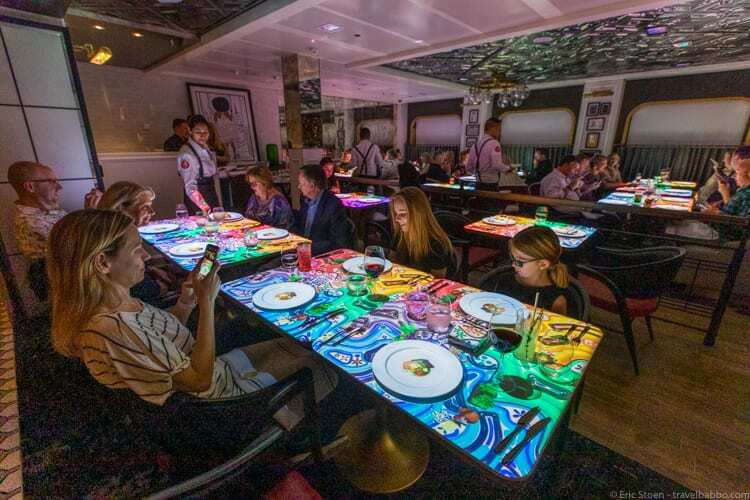 Make a reservation and go. Do not miss out. 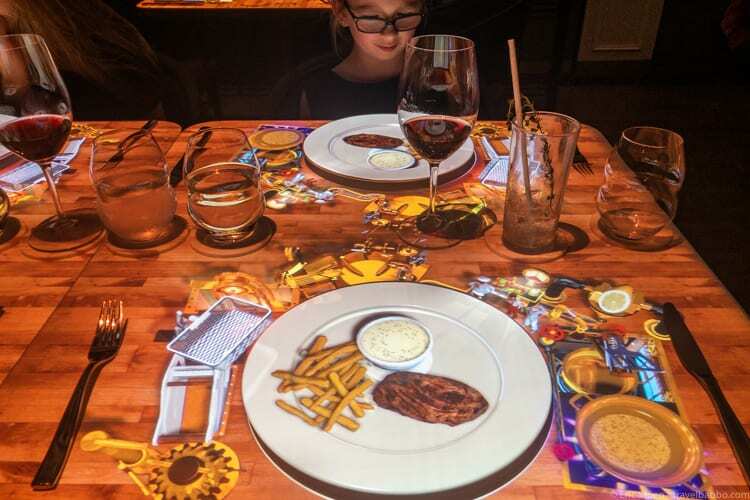 It costs an extra $55 and it’s worth it – a truly unique dining experience where your table comes to life through animation. 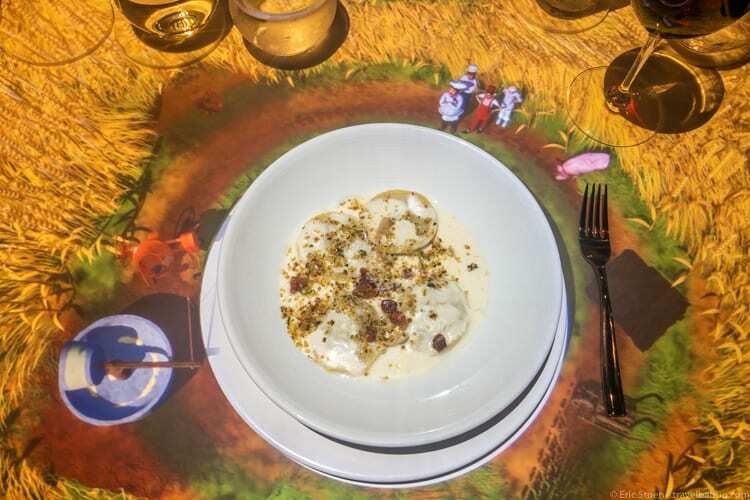 The basic story line is that four chefs (one for each course) are competing to make the best dish, but the fun is in watching each chef create your dish – right before the real version comes out. It really was fun, and the animation is gorgeous and creative. Plus the food was great. 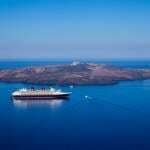 So we’re not anti-Disney by any means, but our Disney Cruises have really tested us as to how much Disney we can take. Well before the end of our 12-night cruises with them we’ve gotten tired of the constant Disney soundtrack, the characters everywhere, the themed dinners, and honestly, the talking down to us by cast members (like hearing “wipey, wipey” when we would enter a dining room). And with staff constantly interacting with us, we always had to be on and ready to interact back. 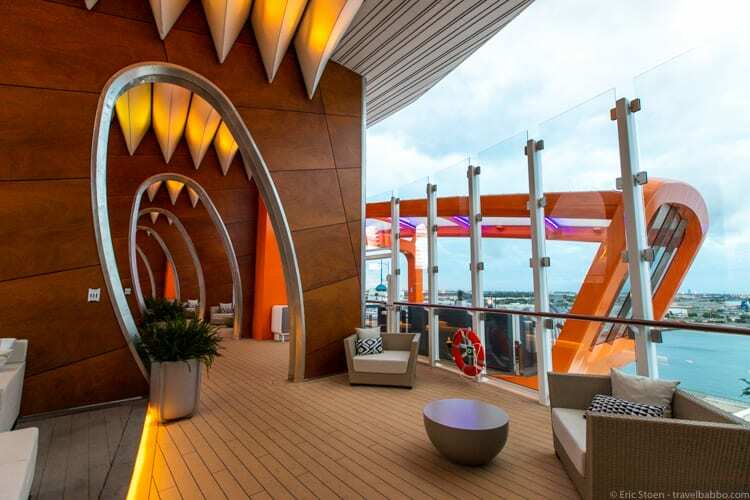 By contrast, the Celebrity Edge was low-key luxury; much more the way we like to vacation. The staff was professional – always around when we wanted them, but not in our faces in a fake-cheery manor when we didn’t. 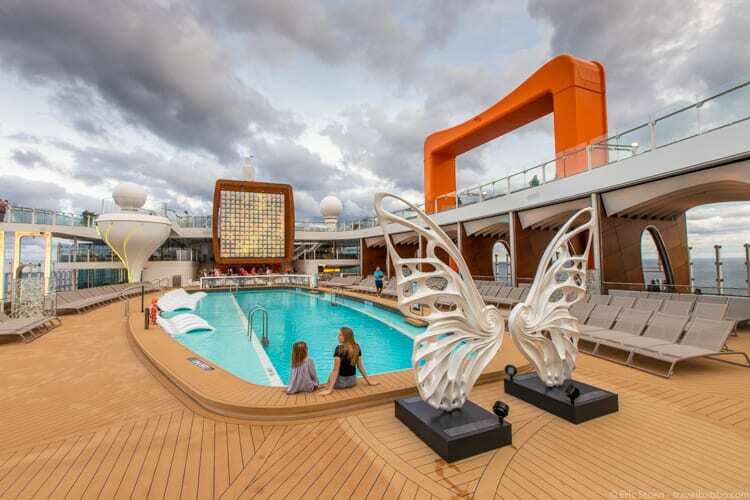 We could relax, and we could enjoy the gorgeous ship. And we both felt like the entire ship was kid-friendly. My daughter was comfortable everywhere. 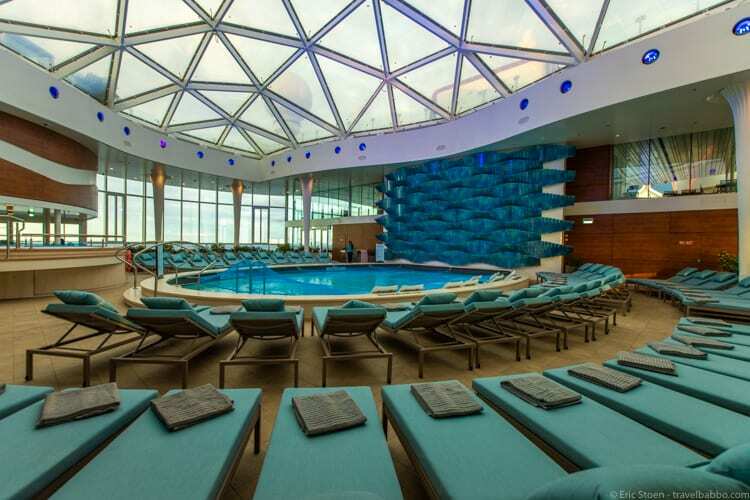 She says she liked it better than Disney – specifically the kids club (info below) and the pool. She doesn’t need a water park or drop slide to have fun. Give her a nice, uncrowded pool and she’s happy every time. And honestly, my kids don’t want to be around 1,000 other kids. You have to stop at the pool wings for a photo! 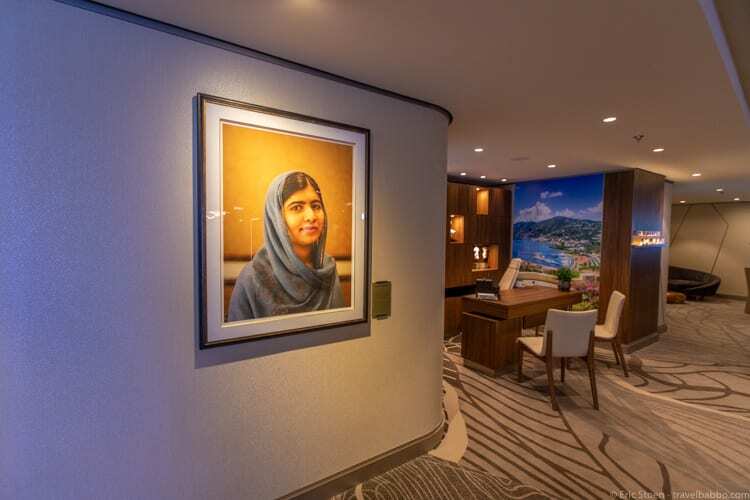 I would say that if you have very active teens and are exploring cruises with kids, they may be bored on the Celebrity Edge. 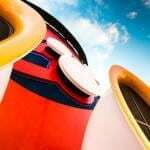 There’s not a basketball court, or climbing wall, or arcade, or crazy pool like we’ve seen on other ships. There are a couple of ping-pong tables, and we loved playing giant Jenga and ring toss at the Rooftop Garden, and there’s a jogging track, but it’s definitely not an amusement park. Again, that’s perfect for how we like to travel. But you may be different. 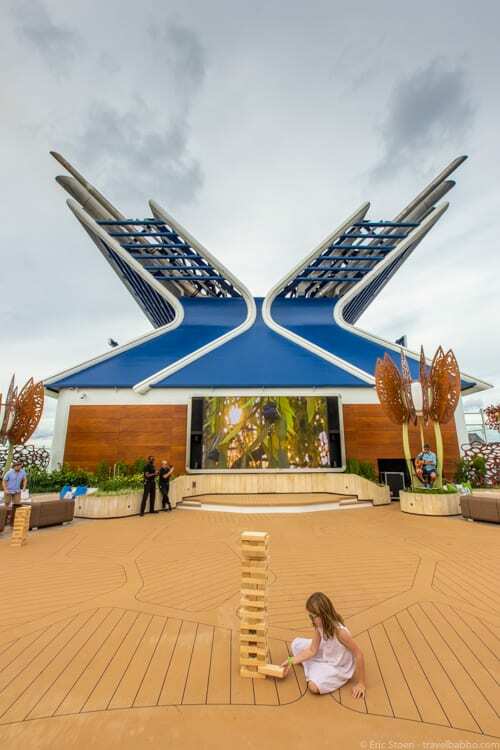 Camp at Sea is the Celebrity Edge’s kids club. There are actually three different sections, for 3-5 year olds, 6-9 year olds, and 10-12 year olds. My daughter loved the section for 10-12 year olds. It’s all STEM-based, with LEGO, robots and computers galore, plus video games and interactive toys like Rubik’s Cubes. We also played Foosball for a while. My daughter was one of only four kids on our sailing and she was completely welcomed at Camp at Sea every time we went down there, but we can’t speak to any of the group activities (scavenger hunts, hula hooping, obstacle courses, coding, robotics, and more). Next time. Note: Camp at Sea is complementary several hours a day, and there’s an hourly charge for other periods, or for sleeping (camping) overnight. Or you can purchase a package that includes everything Camp-related. 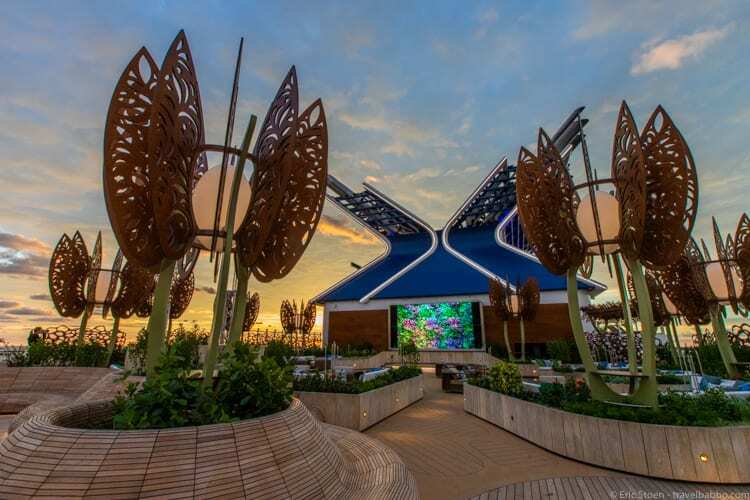 The Celebrity Edge holds 2,900 guests. Our preview sailing had 1,943 guests, so we were roughly 2/3 full. It never felt remotely crowded anywhere, and I can’t imagine that sailing at capacity would feel crowded very often. 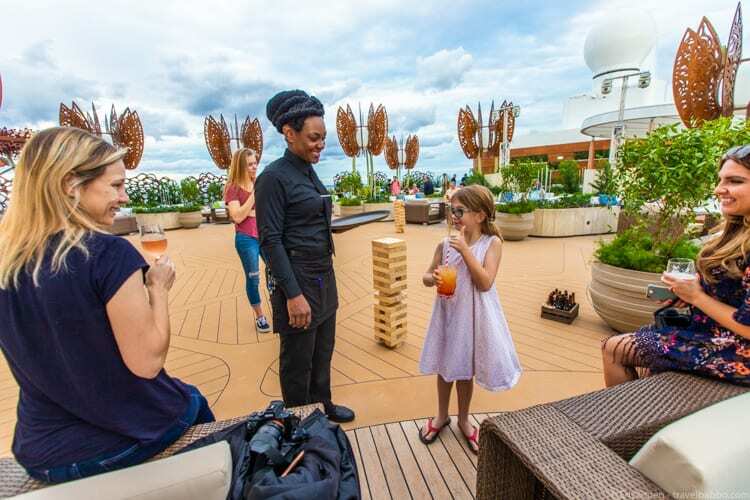 The initial sailings are around the Caribbean (generally seven nights), and then in April 2019 the ship heads to the Mediterranean for 7-11 night itineraries. 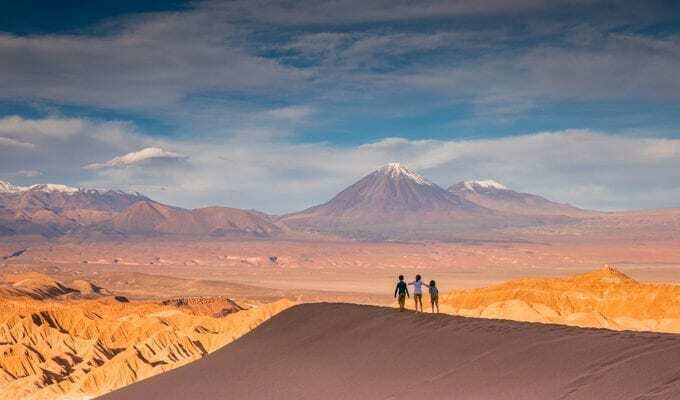 Depending on the sailing, prices start at $999 to $1,849 per person in the Caribbean and $1,709 to $4,189 in the Mediterranean. There’s a discount for groups/families. 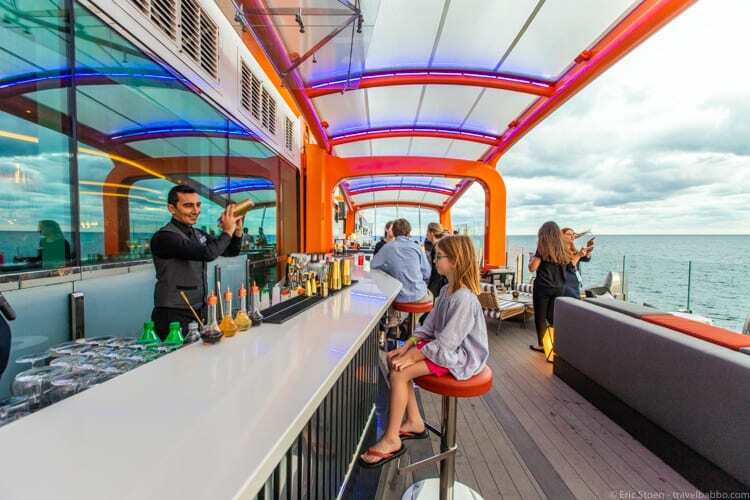 The Celebrity Edge made me like cruises again! 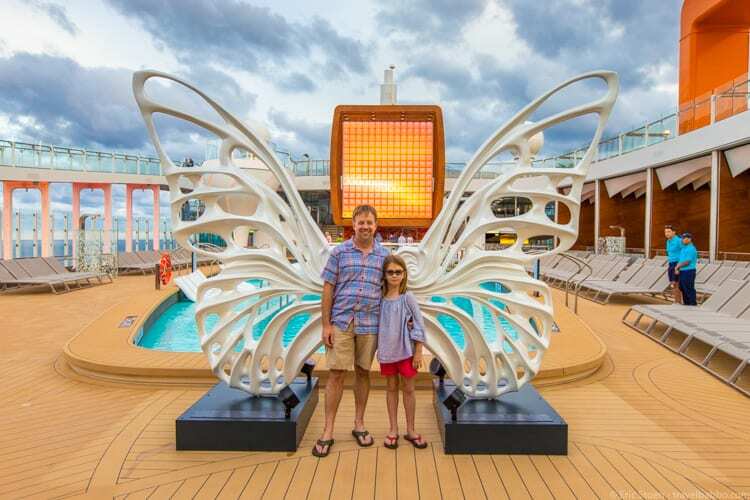 My daughter and I both wished that our cruise was a lot longer. 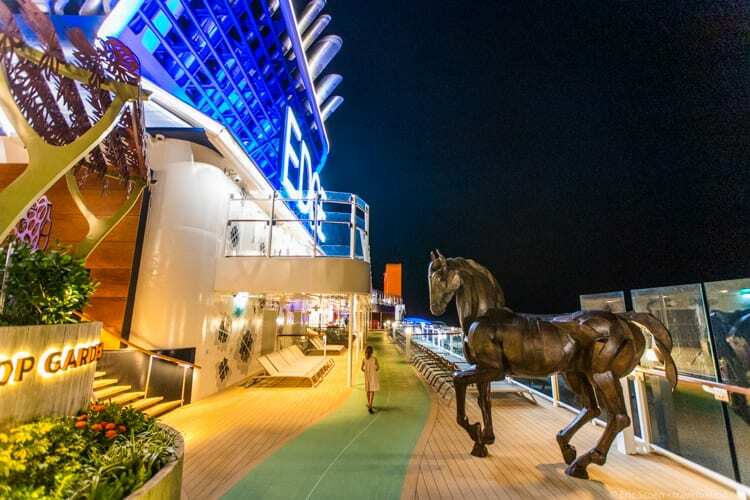 We didn’t stop at any ports, so I can’t speak to the disembarkation/embarkation process, but Celebrity seems to have everything else down to a science so I’m optimistic that there won’t be issues in port. My kids aren’t super-social. 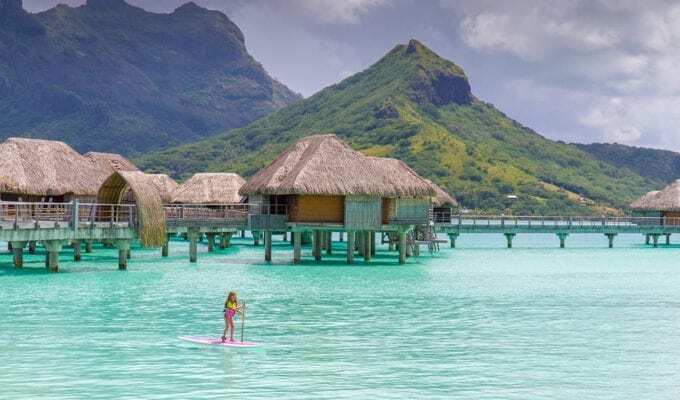 They like reading and relaxing and appreciate luxury and really good food, and this is an absolutely perfect (kid-friendly) atmosphere for that – basically, a wonderful upscale floating hotel where you can unpack once and see different destinations every day. 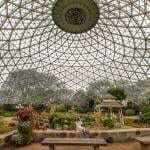 Kind of perfect if you’re not looking for an amusement park!